This forum is for those interested in programming the multi-engine or effects processor on the Korg Prologue. 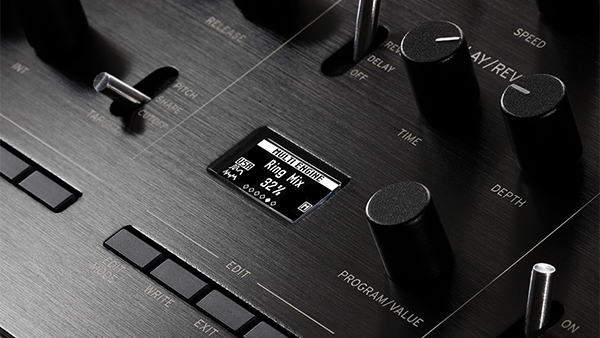 Korg added a small amount of detail on the SDK to their web-site. There are 6 ‘parameters’ that go to the COs – i think this means dynamically active controls – which if true is nice, although Korg seems apologetic about the limit. ADDED: With the 32kb limit, we’ll need to get tricky to cram in every last little bit of functionality. Takes one back 40 years into Apple ][ territory. 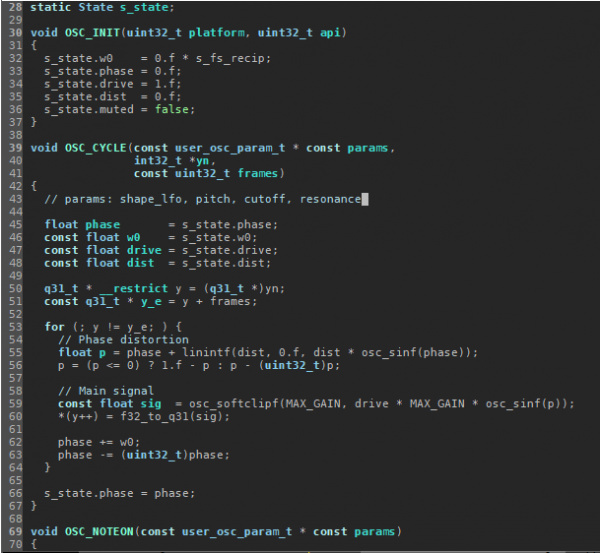 How good is the compiler – anyone ready for assemby? From the Korg site, detail on how to change the 6 parameters sent to the CO. So this OLED is the ‘window’ into control of the CO. Again i presume these are dynamic variables. Obviously you’ll have keyboard controls, note, velocity, etc. The wheel controls and the two pedals data should be available too. So it’s 32 bit, and there is an FPU (floating point unit) and it’s got moderate speed – 180 Mhz. And there are DSP instructions!! so that’s some power. How’s your DSP programming? We’ll see what Korg throws our way as far as library functions and OS environment. Again i want to be able to share functions between COs. You can’t have more than one CO running simultaneously so why can’t they all share data space? ADDED: Oh i get it, RAM vs Flash. ADDED: This is the processor used for the effects. The multi-engine is a different part – a smaller ARM processor. Does anyone have that part number, i can’t quite read it off the Dev Board picture? I’m wondering of the sdk board could be bought and used as a synth instead of the proper keyboard expensive version. though i have no idea about price. I’ve got to assume yes – though there is no doubt some big limitations to this. Price??? My guess is between $100 and $300 – but if this something special as far as a development environment it could be more. ADDED: Korg was handing them out for free at Superbooth – it’s not yet decided whether the Dev Board is going to be available to anyone else. This looks insanely cool. I don’t have any spare time at the mo but maybe one day. The future looks very interesting…! ADDED: I will need to revise this. The calculation may be right but is wrong because i thought the processor used for the effects, was the multi-engine processor. Turns out it’s not, the multi-engine processor is a smaller ARM, probably using the memory on the chip. I will reply to this message when i get the corrected data. Needless to say 32 kbytes is all you get. Let me see here. If i understand you correctly tsutek and i might not. I don’t think the demos and the rest is in the 8 or 16 separate multi-engine storage areas. That would likely lay in a single place with the actual central control of the whole Prologue. On the multi-engine, the VPM could be considerable larger than 32 kilobytes. The noise generator is likely pretty small. And then there is the program to control the analog circuitry and do stuff like LFO etc… In addition there is likely a common library area, with utilities that can be called from the user code – or at least i hope there is, some DSP stuff, a mixer … and maybe even calls into the VPM utilities and the noise generator. I think i got the following correct – someone please correct me if i’m wrong. If they are using the same memory chip with each multi-engine as in the SDK hardware (and they might not be) there would be 4 Megabytes of storage with each multiengine… Sixteen user programs of 32 K each is half a meg. So that leaves 3.5 megabytes for everything else. I know i can be all wrong on this. This answers a lot of questions – Nick talks to the one guy at Korg responsible for the digital side of the Prologue. Oh and tsutek – they talk a lot about demoscenes! The Sonic State Video on this is really good. The developer really knows what he’s doing with this. It also sounds like he was the one who came up with it; cool how Korg allows these things to get done from the bottom up. It’s going to be interesting seeing this develop! cool how Korg allows these things to get done from the bottom up. Korg is that way, Tatsuya Takahashi designer of a ton of stuff recently from Korg talked about that, and it’s clear how many good things happened because of that decision. Korg also sent Etienne Noreau-Hebert, the guy in the video, to Superbooth and put him out in front talking to the customer – which as logical as that sounds, is something that gets missed by the button-down corporate types that commonly make the decisions at other corporations. Plus Korg was handing out the SDK development hardware board for free at Superbooth! Not even the customer. He’s there to talk to developers who might be interested and he’s personally handing out these small development boards to those that he feels deserve to have one. Also, Korg is clearly not interested in getting in the way of people who want to distribute or sell their oscillator implementations or effects in any way the see fit. And taking it all the way to the bottom now – the customer is also the developer now! It won't be that difficult. I know some are thinking, "I don’t program, i can’t do this. " But Korg is obviously going a distance to make things easier than you might imagine. There will be some example programs, and plenty of other nerds will post their code, so at the very least you can take some code and tweak a value here and do something stupid over there and trip over a compile error for ten minutes, and blam you’ve got a sound that no one else has, and maybe it’s surprising and even good. If not just try again. The dev boards are a great idea, I’d love to get my hands on one.